Cloth charging tub. 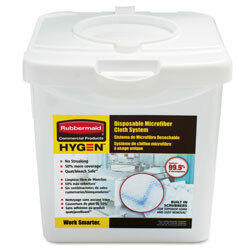 Disposable charging tub aids in infection protection and provides optimal cleaning performance. Convenient charging tub is easy to use. Disposable tub effectively moistens up to 80 microfiber cloths. A vital part of the HYGEN™ Disposable Microfiber System. Depth: 18 1/2"; Width: 8 3/10"; Height: 8 1/2"; Material(s): Plastic. Includes one charging tub. Mop Buckets and Wringers from Rubbermaid! 1151 In Stock today.